I know that cupcakes aren't really a traditional Thanksgiving dessert (if you want something more traditional, check out last week's recipe for pumpkin pie). But hear me out. From scratch, cupcakes come together much faster than any pie. And because they're almost always so pretty and darling, nobody will notice that you didn't bring a pumpkin or sweet potato pie. In fact, quite the opposite. 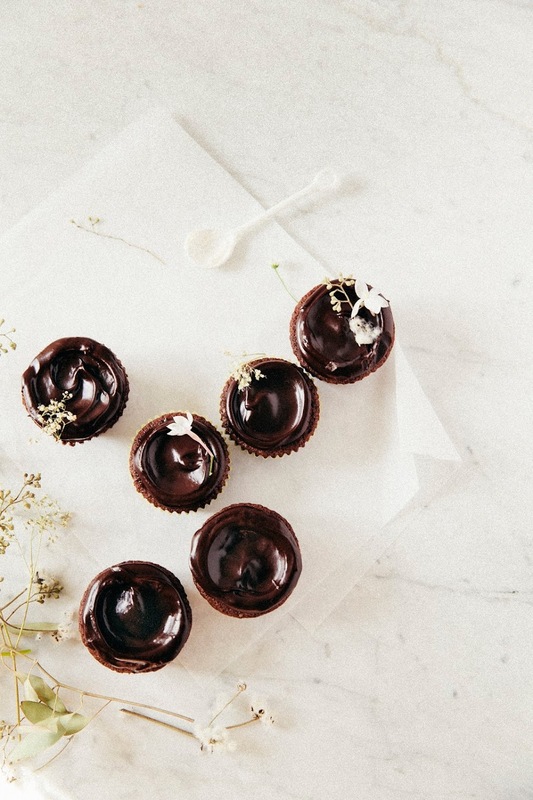 Because everybody loves a good cupcake, right? And these cupcakes are more than just good. They're friggin' great. 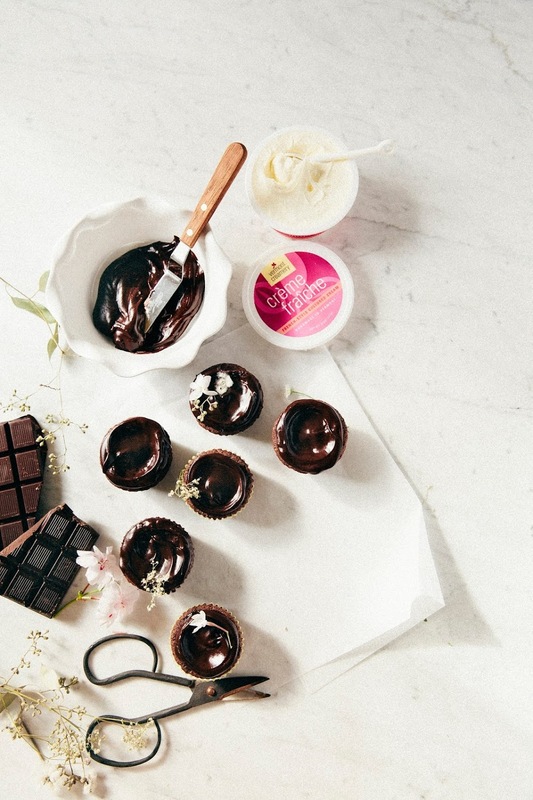 The chocolate cake base has a healthy dose of crème fraîche, a cultured cream similar to sour cream, but milder in flavor. The crème fraîche in the batter acts in the same way buttermilk would, giving the cake a subtle tangy flavor and keeping its crumb incredibly moist. 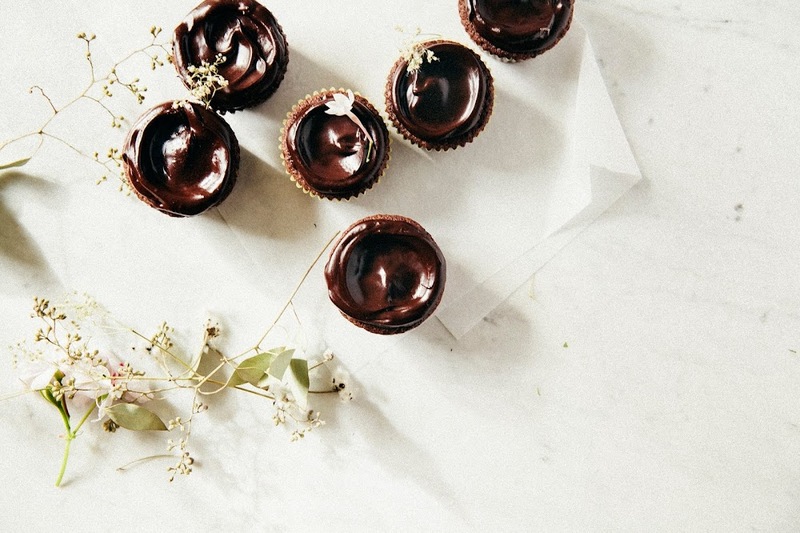 But the real star of the show is the chocolate crème fraîche frosting. It's incredibly chocolatey, creamy, and velvety. 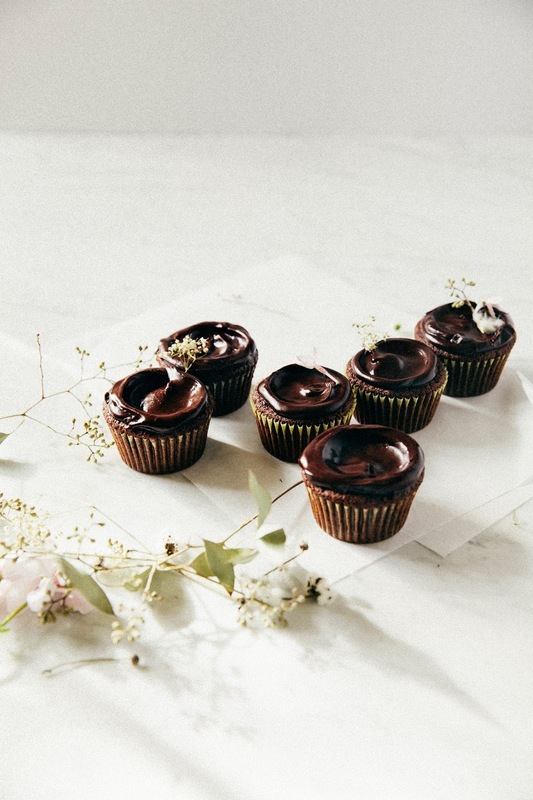 And what's more, it's low maintenance — all you need to do is top each cupcake with a generous dollop of the stuff, and watch it set into a beautiful, shiny frosting. And that's not even all. Because the best part is that the whole thing comes together in an hour or so. I promise. It's perfect as a last minute Thanksgiving dessert. 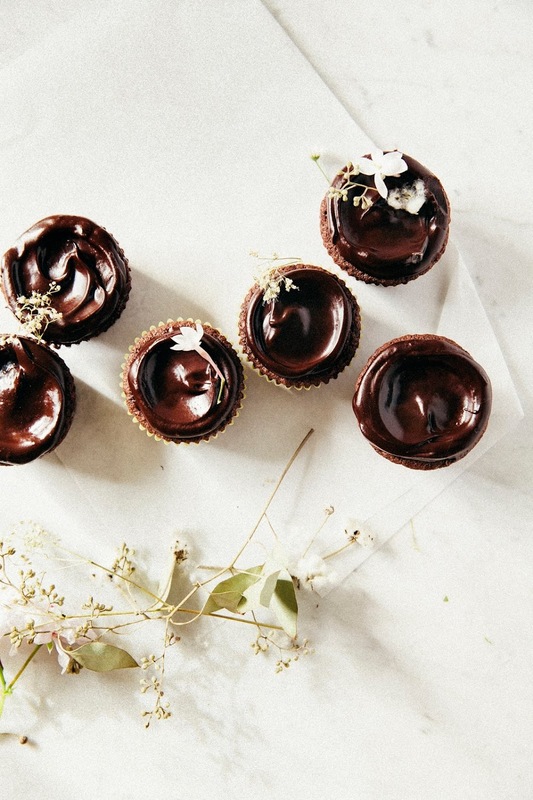 And with cupcakes like these, who needs pie, eh? Thank you to Vermont Creamery for sponsoring this post by providing compensation and ingredients for the recipe. I worked with them the entire month to provide recipes like red velvet cake and pumpkin pie centered around their amazing crème fraîche. It's genuinely one of my favorite ingredients to bake with, and I hope you guys give it a try sooner rather than later. As always, all thoughts and opinions are my own. Thank you for supporting Hummingbird High and my sponsors! After dividing the cupcakes, you'll likely have enough batter for one or two more additional cupcakes. DON'T, however, be tempted to use that leftover batter and fill the cupcakes some more. Because this batter creates such a light and airy crumb, overfilling the cupcakes in their tin will cause their tops to spread out weirdly across the pan. The ideal proportion is around 2 tablespoons per cupcake for that classic domed look. The frosting will initially seem too runny after you make it, but believe me — it will thicken as it cools. Just be patient and wait for the ideal texture. The ideal texture will be silky, spreadable, and will set into a beautiful gloss pretty soon after frosting. But also, beware! If you wait too long, however, the frosting will be too thick to spread. But don't worry — if that happens, you can always warm the mixture over a double boiler until it becomes spreadable again. Center a rack in the oven and preheat to 350 (F). Prepare a 12-cavity muffin tin by lining with cupcake liners. In the bowl of a freestanding electric mixer fitted with a whisk attachment, combine 1 ounce coarsely chopped dark chocolate and 1/3 cup hot coffee. DO NOT STIR — let sit for 2 minutes to allow the chocolate to melt. 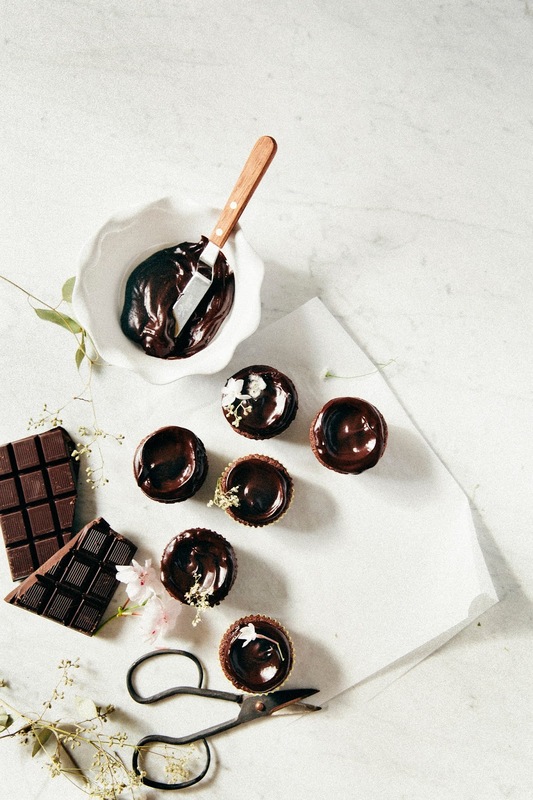 As the chocolate is melting, combine 3/4 cup all-purpose flour, 1/2 cup unsweetened cocoa powder, 1/2 teaspoon baking powder, 1/2 teaspoon baking soda, and 1/2 teaspoon kosher salt in a medium bowl and whisk until combined. Set aside. Return to the chocolate. At this point the chocolate should be melty and easily melt into the coffee when whisked. Turn the mixer on its lowest setting and whisk the chocolate and coffee together, then add 1 cup granulated sugar, 1/2 cup crème fraîche, 1/3 cup vegetable oil, 1 large egg, and 1 tablespoon pure vanilla extract. Continue whisking until just combined. Stop the mixer and sprinkle the dry ingredients (from the 3rd step) over the liquid ingredients (from the 4th step). Turn the mixer back on to medium-low and continue whisking until the dry ingredients are just incorporated. Use a rubber spatula to scrape down the sides and incorporate the additional batter with a one or two stirs. Use a 1-tablespoon cookie dough scoop to divide the batter evenly between the cupcake liners – see baker's notes; be careful not to overfill! I used about 2 tablespoons per cupcake. Bake in the preheated oven until the cupcakes are domed and the top springs back when gently touched, around 20 to 25 minutes. Remove from oven and allow to cool on a wire rack to room temperature before frosting. Once the chocolate and butter have fully melted, remove from heat. Whisk the mixture gently to release more heat, before whisking in 1/4 cup crème fraîche and 2 tablespoons half-and-half. Continue whisking until both the crème fraîche and half-and-half are fully integrated and the frosting is a uniform dark chocolate color. Set the frosting aside for 15 minutes to cool some more, giving the frosting a gentle whisk or two every 5 minutes to allow heat to escape. After 15 minutes, use the frosting. At first, it will seem too liquidy, but the frosting will quickly cool as it is spread throughout the cake. Work quickly to frost the cake before the frosting cools completely — it will harden as it cools. 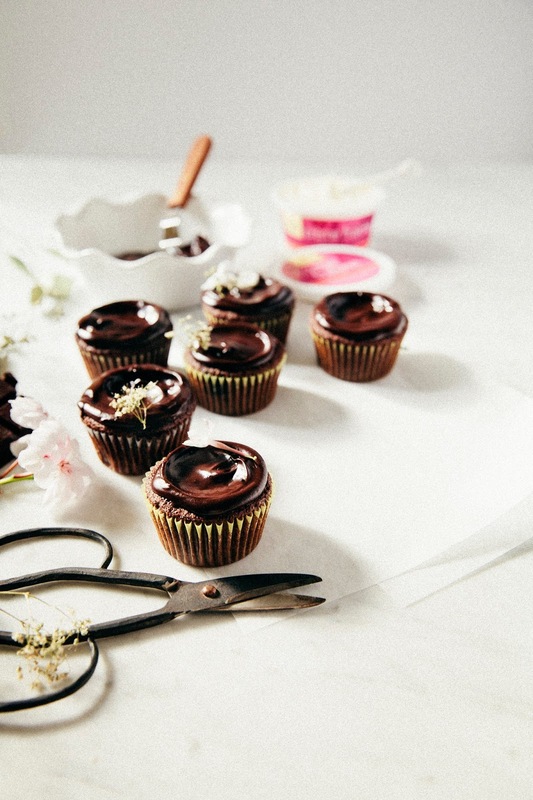 Use an offset spatula or a butter knife to divide and spread the frosting evenly between the cupcakes, and garnish with any additional decoration.